A suitably grown up Easter Cake. 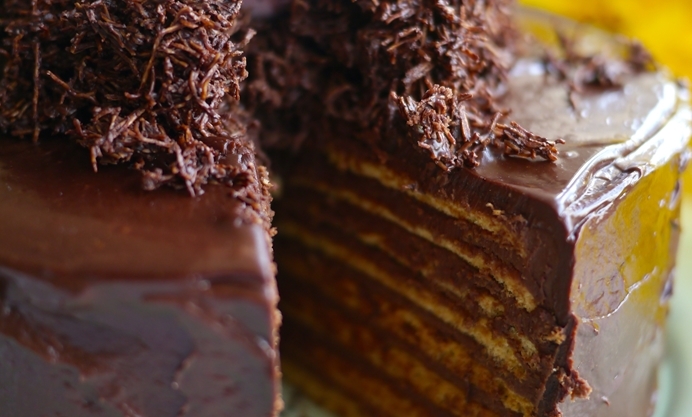 Victoria's eight layered beauty is the perfect way to celebrate the long weekend with some chocolate indulgence. For non-religious types, like me, Easter is only really about one thing and one gloriously decadent and indulgent thing at that. Chocolate! 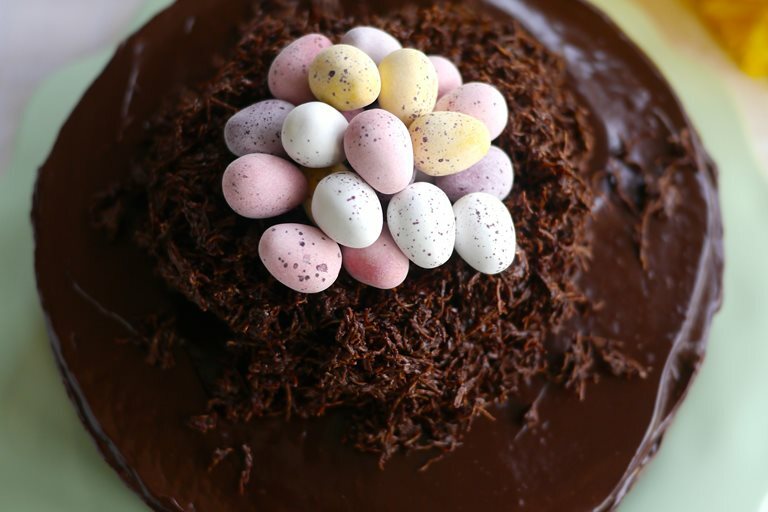 Chocolate eggs, chocolate cakes, chocolate shredded wheat nests and, possibly best of all, the chocolate-smeared cheeks of children. OK, so traditionally it's Simnel cake that people make at this time of year, but marzipan and candied peel just don't cut it for the under 10’s, who happen to be the main target market for this particular Easter number. But, in the spirit of inclusivity, I’ve decided to go a bit glam to appeal to the grown-up contingent too, with an 8-layered Easter take on a Prinzregententorte. I've topped my cake with a chocolate Shredded Wheat nest (well, it would be rude not to) stuffed to the brim with Cadbury’s Mini Eggs. You can go posher, if you like, with the likes of Rococo Chocolates Salted Caramel Superior Seagull Eggs or a few of William Curley’s Praline Feuillantine offerings, but I’ve got a nostalgic attachment to Mini Eggs, so I’ll be sticking with them. Talking of eggs, I can't think of many greater pleasures than bursting open a hollow chocolate egg using only the power of your jaws. Which brings me on to one of my biggest Easter gripes. Why do so many eggs, nowadays, come in two halves? That's not the point at all! You're supposed to be able to bite the top off. And this action absolutely must contain a small element of struggle (if only in the discovery of the least ungainly approach) to maximise feelings of chocolate-conquering pleasure. Once the top of your egg's off, you can push and pull at pieces of fractured chocolate, so that some fall inside and rattle around like loose change in a piggy bank, which can, of course, only be retrieved by holding the egg upside down and shaking it over your wide open mouth. I like Easter.